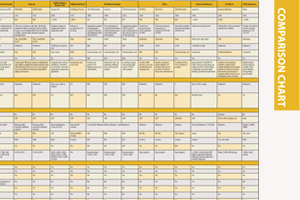 This article originally ran as an introduction to the Flat Panel Displays comparison chart in the April 2019 issue. You can view the chart here. The flat panel display market shows signs of maturing, however many new applications are available that can help to streamline workflow and enhance productivity for clinicians. Several new state-of-the-art displays were highlighted at the 2018 Radiological Society of North America (RSNA) annual meeting, a few of which are highlighted here. U.S. Electronics Inc. (USEI) released what it calls the world’s first Windows-compatible medical display viewing solution leveraging high-quality iPad displays, ideal for clinical review and reference monitors for patient review. The dual-monitor workstation, which was on display at RSNA 2018, offers the smallest form factor viewing of 3 megapixel (MP) medical images and comes with USEI’s XR-Vue viewing software. The product enables a cost-effective workstation without the need to purchase high-cost 3MP monitors. The iPad viewing solution works on any Windows OS computer. LG Electronics expanded its U.S. medical imaging portfolio with a new high-performance 21-inch diagnostic monitor. Unveiled at RSNA 2018, the advanced new device joins LG’s portfolio of medical monitors designed to sharpen visuals while maximizing efficiency for elevated professional care. LG’s medical imaging product line is designed to meet a variety of hospital needs, including consultation rooms, the operating table and radiography labs. Features such as the viewing angle of LG’s advanced in-plane switching (IPS) technology make it possible for multiple medical professionals to view the monitors from different angles with minimal color distortion and more precise imagery. In addition, LG’s 27-inch 8MP clinical review monitor features DICOM out-of-the-box calibration to ACR-AAPM-SIIM secondary review brightness guidelines, plus a backlight sensor that maintains DICOM-calibrated brightness for three years. Equipped with 5:4 aspect ratio, LG’s 19-inch LG clinical review monitor is designed for cardiology and other medical applications that require a medical safety-approved monitor with analog and digital video inputs. At RSNA 2018, Eizo Corp. released its RadiForce RX360, a 21.3-inch 3MP color medical monitor ideal for viewing monochrome and color medical images. It comes with unique features to improve work efficiency and save space in the reading room. The RadiForce RX360 is the successor model to the RadiForce RX350. The monitor comes equipped with an LTSP (low-temperature polysilicon) panel with LED backlight that ensures a maximum brightness of 1,100 cd/m2, making it recommended for accurately viewing picture archiving and communication system (PACS) images such as grayscale X-ray, computed radiography (CR) and digital radiography (DR), as well as color images such as 3-D rendering and image fusion. Compared to the 13.8 mm bezel width of the RX350, the RX360’s bezel has been reduced by 46 percent to 7.5 mm. When using two monitors side-by-side the total distance between screens measures only 15 mm, making it easier to focus as the eye passes from one monitor to the other. In order to make diagnosis more efficient and comfortable, the monitor comes with multiple work-and-flow features to improve work efficiency. Also in 2018, Canvys, a division of Richardson Electronics Ltd., enhanced its 4K Ultra HD custom display series of high-brightness monitors with two new screen sizes. The new 27-inch and 32-inch ultra HD monitors are designed to deliver high-quality images with top work performance. In addition, Canvys is now offering optical bonding as a custom option for this series up to 32 inches. The complete line of the Canvys 4K Ultra HD displays include screen sizes from 23.8 inches to 84 inches. The new 27- and 32-inch models include high brightness with built-in panels that increase the brightness of the display from 190 to 260 percent, making them useful in unfavorable lighting environments. Canvys offers optional optical bonding for the 4K series up to 32 inches. This is a technically complex process that involves gluing the LCD module to the touchscreen or protective screen, which help to optimize the image quality in terms of contrast and color representation.